Das sind nur einige Assoziationen – die konzeptionellen Möglichkeiten mit einem Zorb als Botschaftsmedium sind schier unerschöpflich. When Goodyear launched its new tyre, they needed a fun, innovative and eye-catching way of communicating their key messages. The HydraGrip tyre’s major selling point is its outstanding ability to grip wet surfaces better than any of its competitors and although this was a great trade story it did not interest the consumer press – until the birth of the HydraZorbs. Goodyear commissioned two 12ft diameter zorbs and had them specially tailored to take to the water, then launched a new British sport with the intention of finding Britain’s HydraZorbing champion. Attending major events across the country, the Goodyear HydraZorbs not only had great branding but also carried the underlying messages of innovative fun and uncompromising safety in wet conditions. 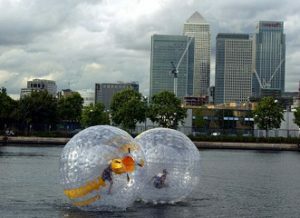 Journalists certainly embraced the idea as well, with HT persuading reporters from Sky Sports News, The Daily Express, The Metro and many other organisations to climb inside and test their own skills in the HydraZorbs – leading to around £100,000 worth of coverage. There was also an effective charity tie-up with the RNLI benefiting from the fact that Goodyear asked people to make a discretionary donation in exchange for their once in a lifetime experience. TEQUILA\’s promotion for the Nissan X-Trail ‘The X-Trail Zorb’ picked up Gold at the North West Cream Awards on Friday in the ‘Best POS and Sales Promotion Category’. The Cream Awards, which are run by Adline, the marketing magazine for the regions, award excellence in advertising and marketing. The Nissan ‘X-Trail Zorb’ now goes up against the other regional winners of the ‘Best POS and Sales Promotion Category’ in January at the ‘Cream Grand Prix’ to be held in Birmingham. Sie haben eine Idee und sind sich nicht sicher, ob sie umsetzbar ist? Oder Sie möchten Anregungen, ganz auf Ihre Anforderungen und Vorstellungen zugeschnitten? Rufen Sie uns einfach an, oder schreiben Sie uns – wir lieben spannende Ideen!